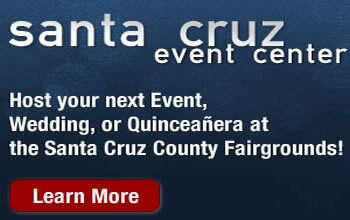 Watsonville, CA - The Santa Cruz County Fair Board of Directors has selected the theme for the 2009 edition of the Fair. "Barnyard Beach Party" blends the reality of the unique setting provided by Santa Cruz County. Manager John Kegebein observed "From where I stand during each fall Fair I can see the Monterey Bay and the rich bounty of agriculture. Yes, even a chicken coop." It will be around the theme of a Barnyard Beach Party that the many participating youth and civic groups will build the wonderful displays fairgoers enjoy each year. The Fair held a contest earlier this year and local resident Barbara Powell submitted the winning theme via email. Powell is a board member and volunteer executive director for the Redman-Hirahara Foundation and was pleased she could contribute.